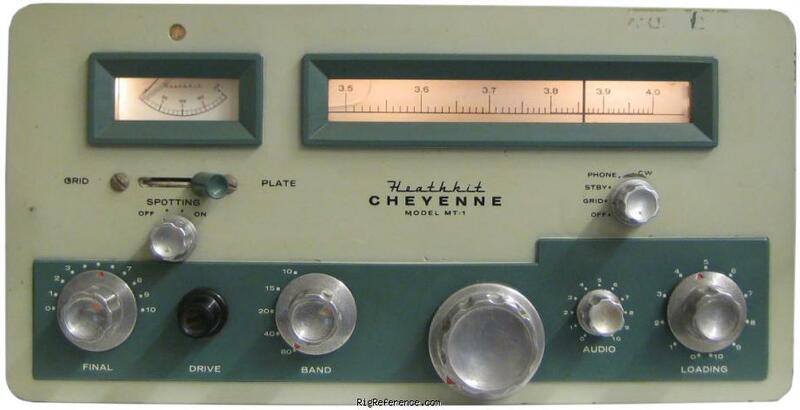 The Heathkit MT-1 'Cheyenne' transmitter matches the Heathkit MR-1 'Comanche' receiver. It features a built-in VFO, controlled carrier modulator, four RF stages, 6146 final amplifier, and pi-network (coaxial) output coupling. A spotting switch is provided to allow tuning the transmitter "off-the-air" and a specially designed ceramic element microphone with push-to-talk switch assures properly shaped audio response for effective modulation with plenty of "punch." All power necessary for mobile operation is furnished by the Heathkit HP-10 mobile power supply. Simple conversion to fixed station operation is easily accomplished by using the Heathkit HP-20 AC power supply. Styling of both the "Comanche" and "Cheyenne" features a one-piece die-cast front panel with raised meter, tuning dial and control panel escutcheons, and die-cast knobs. Color styled in two-tone gray and gray-green. Estimating the value of a rig can be challenging. We collect prices paid by real hams over the years to help you estimate the current value of the Heathkit MT-1 'Cheyenne'. Just bought or sold this model? Let us know what you traded it for and help other ham operators!